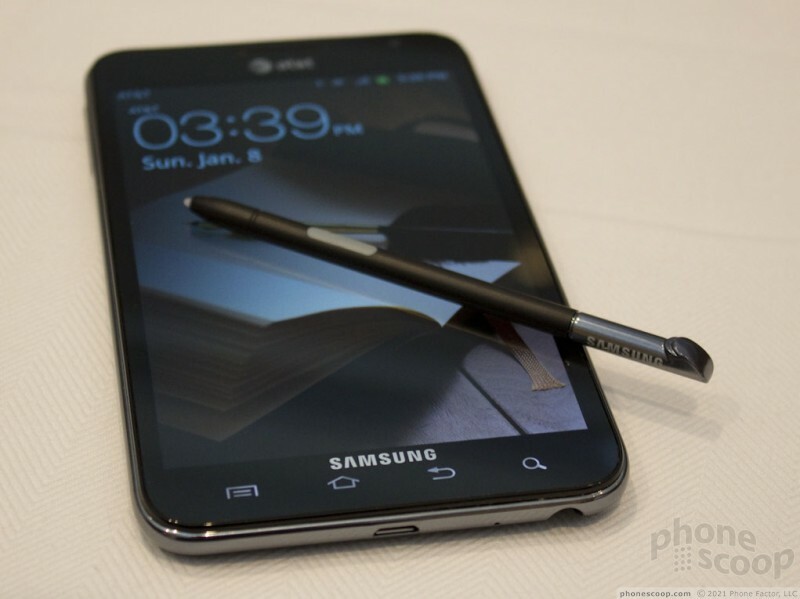 Samsung announced the Galaxy Note back in late 2011, but it wasn't until this week in Las Vegas at the Consumer Electronics Show that AT&T revealed it will be sold by the nation's number two carrier. The Note is preposterously large. 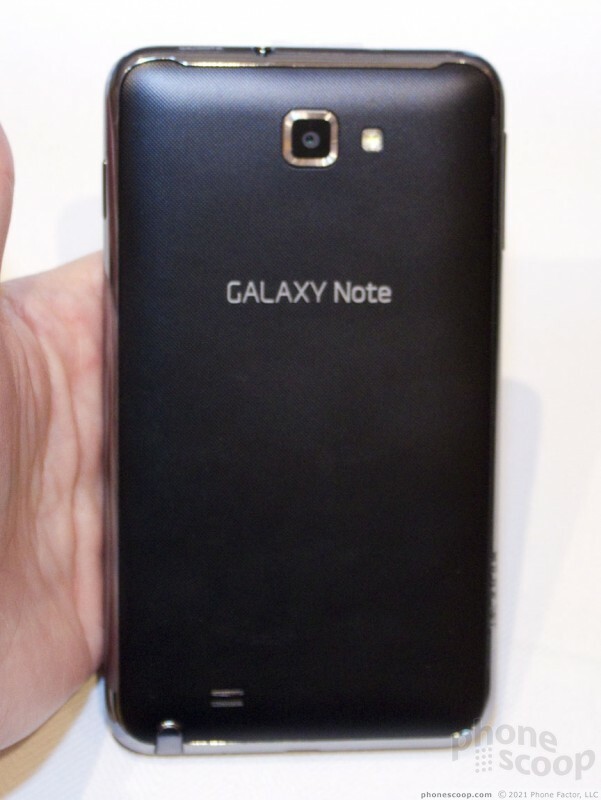 It looks nearly identical to other Galaxy-class smartphones released by Samsung but to the Nth Degree. 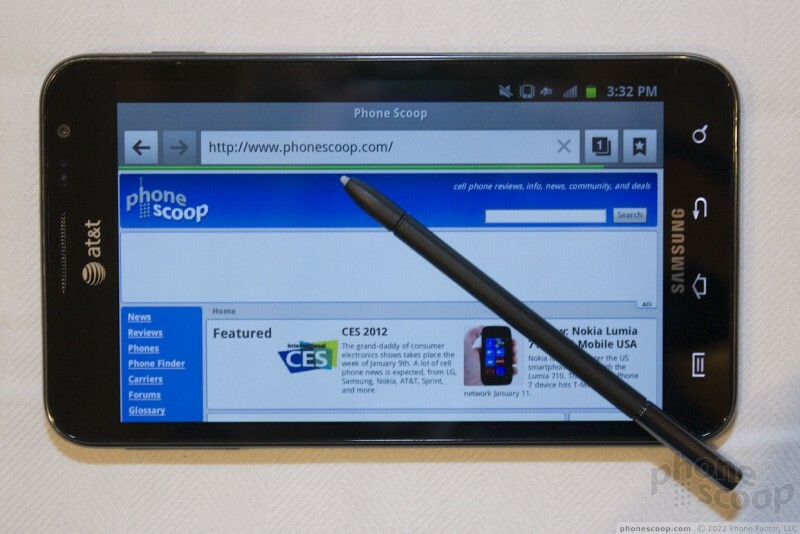 Its 5.3-inch display commands palm-stretching length and width measurements. It feels incredibly huge in the hand. I have large hands, and I had a hard time keeping it firmly in my grasp. 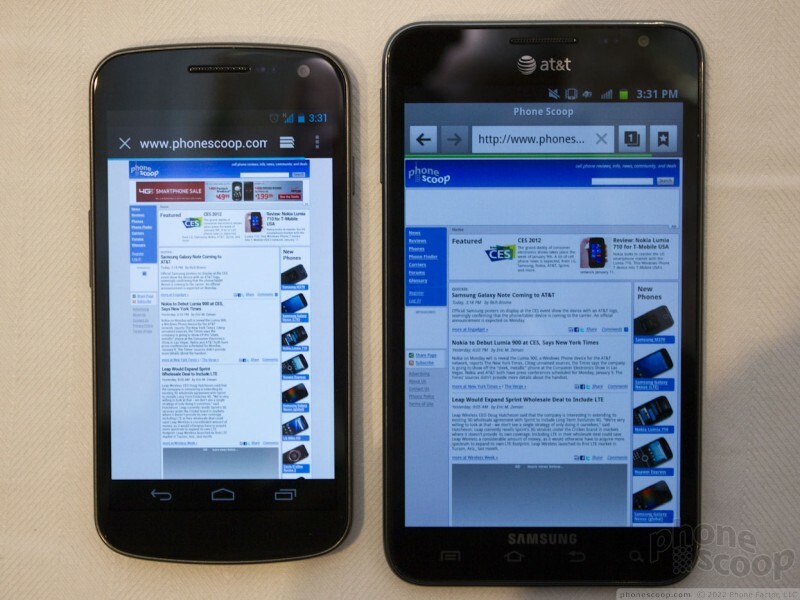 It definitely feels more like a small tablet that it does a large phone. The Note's saving grace is its waist line. 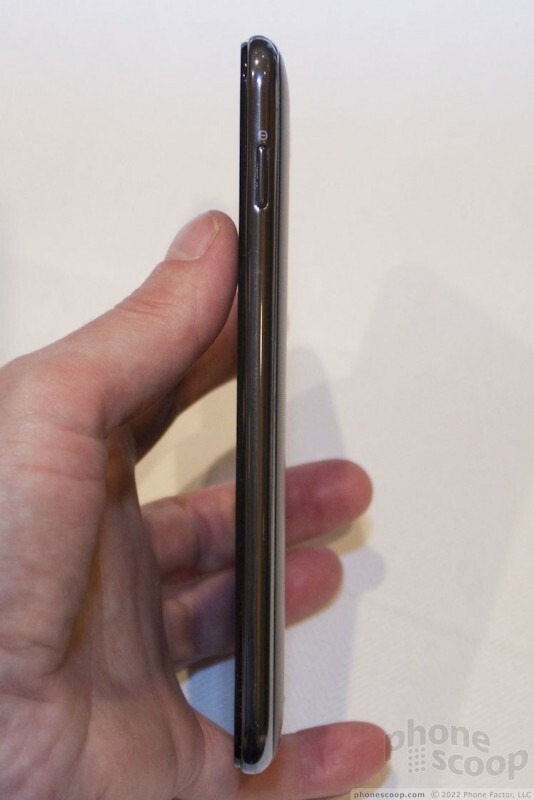 It my be wide and long, but it is as thin as any smartphone on the market. That means you can slip it into tight jeans pockets, but you'll know it is there. Oh, you'll know it is there. 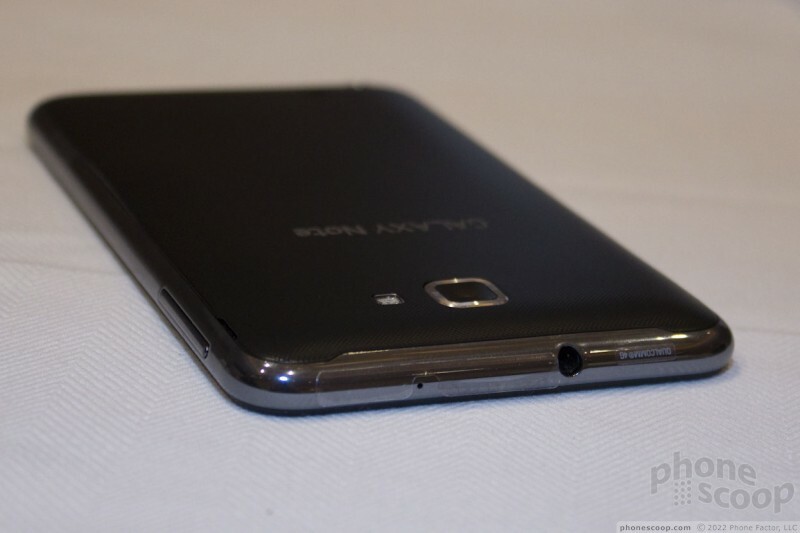 The materials are about the same as other Galaxy devices, which is to say cheap-feeling plastics. 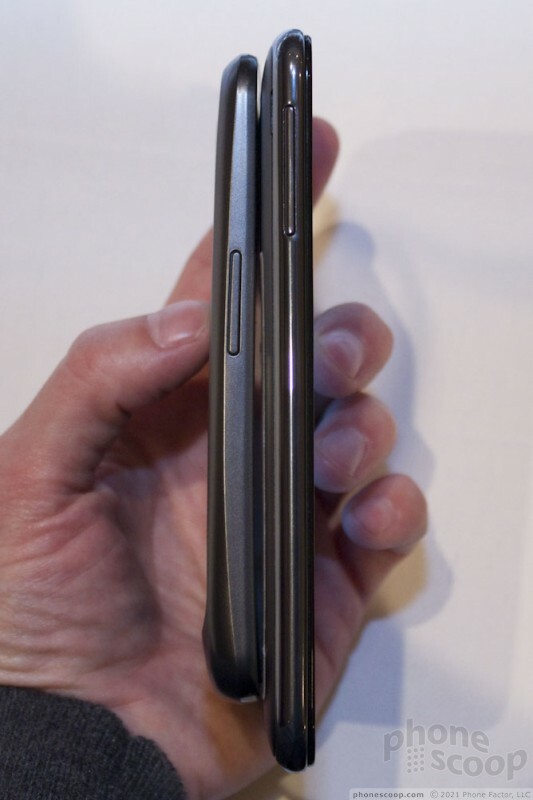 There are no obvious metal pieces in the make-up of this phone, though the glass of the display felt strong and smooth. The plastics that rim the sides and top/bottom of the Note are slippery and shiny. 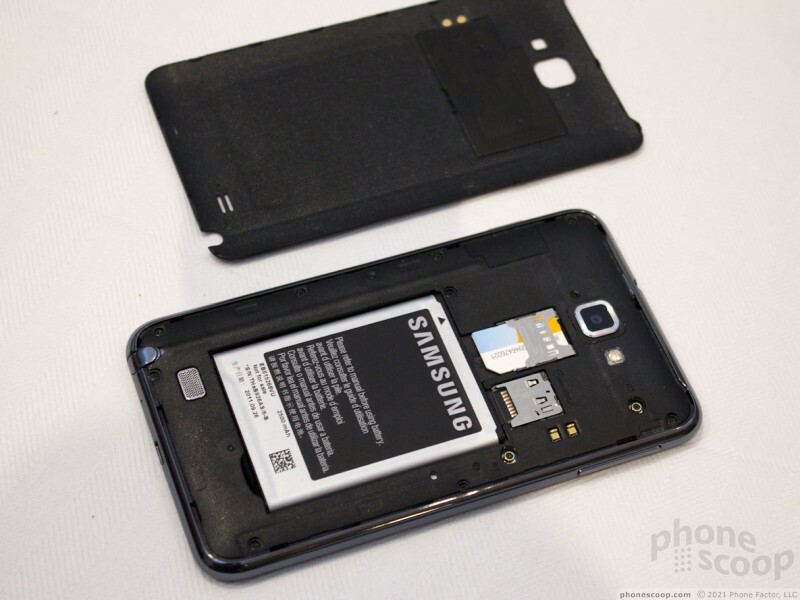 The battery cover has a mild textured feel to it, as have other Galaxy-branded devices. The quality of the manufacturing felt good, and I didn't see any obvious problems with the way it was put together (though, admittedly, the battery cover was realyl hard to remove). The volume key is on the left side of the phone and felt great. It is one of the better volume toggles I've used on a Samsung device in recent memory. It is realyl easy to find, and the travel and feedback are spot on. 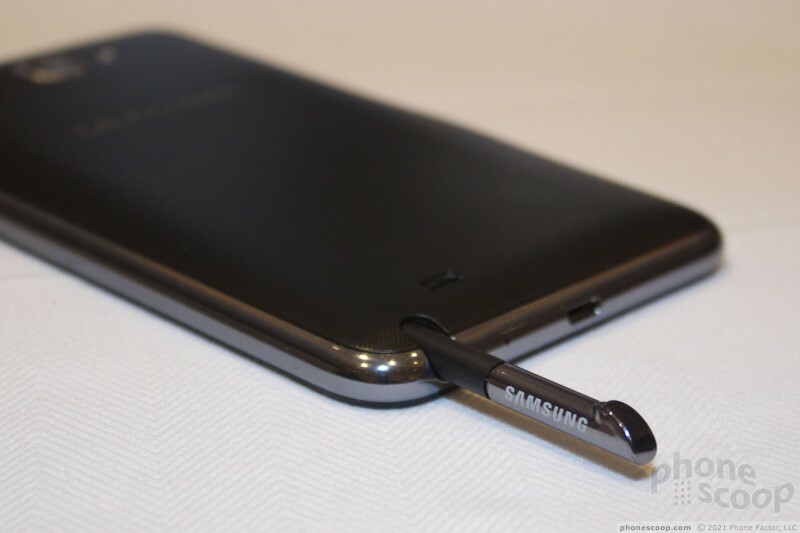 The microUSB port is on the bottom, the 3.5mm headset jack is on the top, and the power/lock button is on the right side. This button also feels good. For a phone this size, I was disappointed to see no dedicated camera button. Surely Samsung wasn't lacking in real estate. 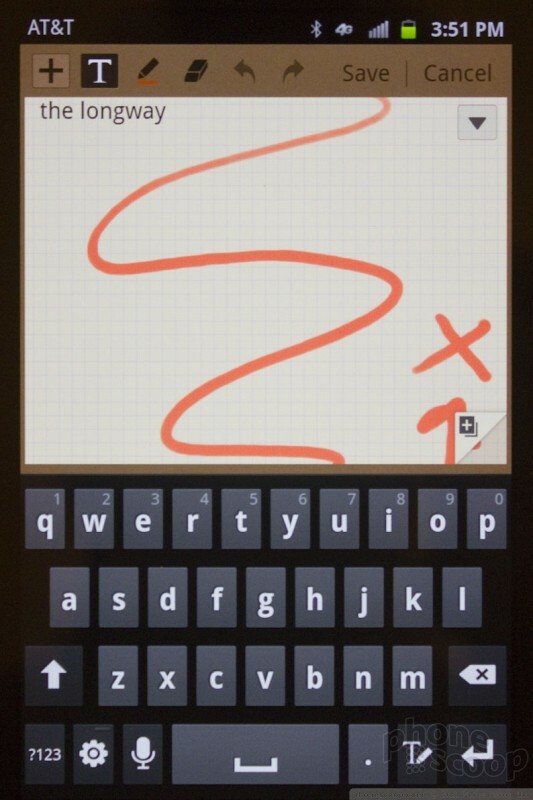 The Note runs the latest version of TouchWiz on top of Android 2.3.6 Gingerbread. Samsung would not say if or when the Note might be updated to Android 4.0. 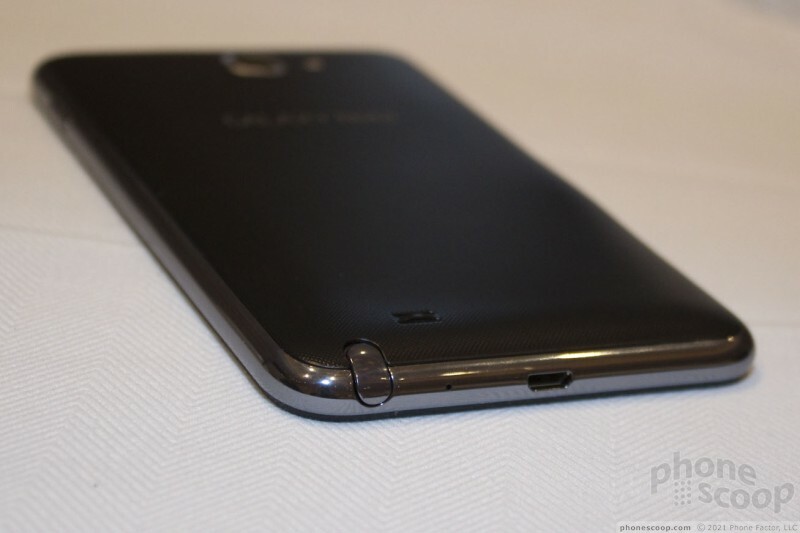 The user interface looks identical to those we've seen on other Galaxy-class devices from Samsung. It offers seven home screens for customization, plenty of widgets, and a criminally large number of applications. One thing you may notice right away is that the screen can hold 25 applications per page, rather than the normal 16 or 20. 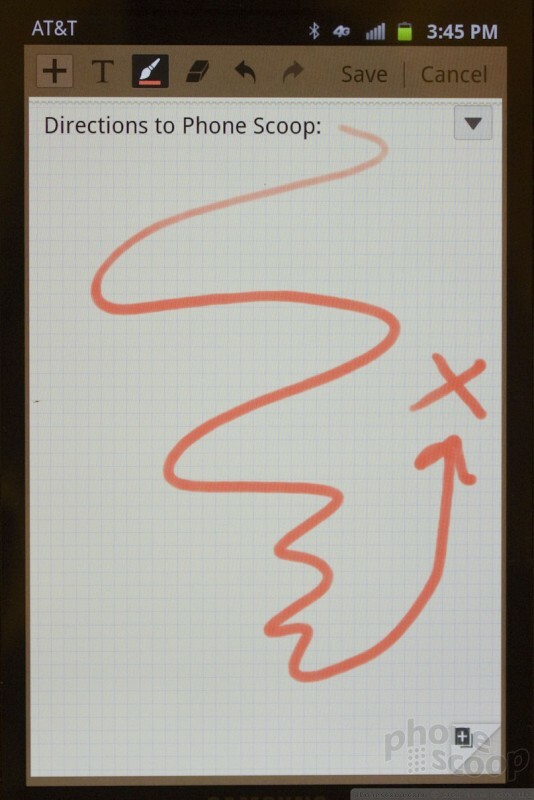 You can cram an outlandish number of applications onto the Note, and still see half of of them on a single screen. The one unique aspect to the Note — other than its size — are the pen capabilities. The Note ships with a stylus that interacts with the capacitive tough display and can be used across the entire user interface in place of your finger. 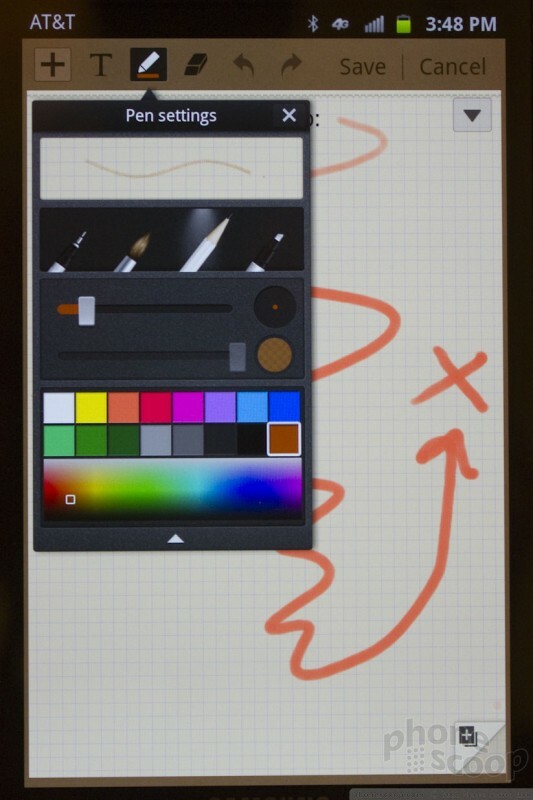 There are also tools that let you take screen shots with the pen, double-tap the pen to see a note-taking application, as well as several applications that were written directly for the stylus. It is a neat set of features to have.